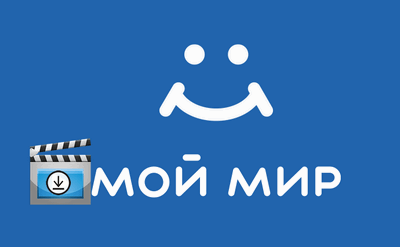 Moi Mir (my.mail.ru) means My World (Russian: Мой Мир), which is the third biggest social media website in Russia after VKontakte(VK.com) and Odnoklassniki(OK.ru). On My Mail.ru, you can find friends and share photos, read blogs, answer questions, join groups, play games as well as watch great videos. Various wonderful videos are uploaded to Mail.ru every day. Users can visit the video catalog to view popular videos, and videos from different channels like Cinema, Series, Humor, Games, and Sports. I know many of you want to download attractive and fantastic videos from Mail.ru so that you can watch them offline without the worries that the videos would be deleted or not be found one day. Since Mail.ru doesn’t offer a video download option, this article introduces two free and effective methods for Mail.ru video download. It is illegal to distribute and copy copyrighted content for commercial purposes without the permission of the original content owner. This guide is intended for personal and fair use only. WonderFox Free HD Video Converter Factory enables to download Mail.ru videos in the easiest way. 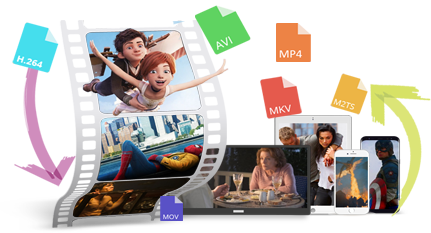 Besides Mail.ru, it also can download videos from YouTube, Facebook, Vimeo, Dailymotion, BBC, and other 300+ sites and convert video/audio files to MP4, MP3, WAV, AVI, WMV and so forth. Now more and more people choose software to download online videos since desktop tools are more reliable, secure and faster. Some of them even offer more useful tools. The most recommended option for Mail.ru video download is WonderFox Free HD Video Converter Factory. It is a powerful and fast video downloader that can download videos using URL from most social media and free music websites. The software is completely free yet it performs better than any other similar free tools. Apart from being a video downloader, it’s also a practical video converter and video editor that offers basic video editing functions like crop, clip, rotate, flip, add special effects, etc. Before the start, please free downloadfree download and install the software on PC. Open WonderFox Free HD Video Converter Factory, and click on the Download Video button. Copy the URL of the Mail.ru video and paste it into the Add URL box. Click on the Analyze button and the software will quickly detect and analyze the video URL and display all the formats, sizes and resolutions you can select from to download Mail.ru videos. Open the drop-down list and choose a resolution and format. Finally, click on the Download button to save the Mail.ru video to your computer. Tips. 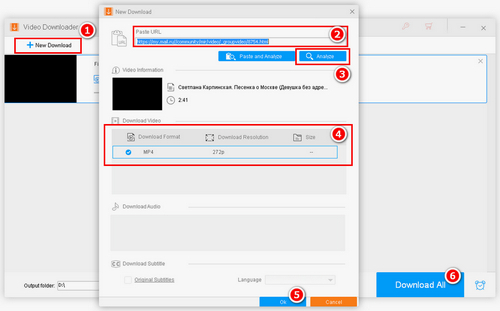 If you want to convert Mail.ru videos to more formats, click on the Output Format button on the right of the main interface and choose the needed video/audio formats. Over 300 digital formats and ready-made presets for popular devices are supported. Besides, it can help you change video resolution, bit rate, aspect ratio, and frame rate. Just go to the Settings window to adjust these video parameters. Both the two websites are easy to use. Here I take 9xbuddy as an example. To save video from my Mail Ru with the latter website, the steps are similar to the ones of 9xbuddy. Step 1. Open 9xbuddy, copy and paste a Mail.ru video URL into the blank box, and click on the orange Download Button. Step 2. It will display the analysis progress. When the progress bar disappears, it means that the analysis is finished. Scroll to the video download section. Step 3. Choose a video format/quality, and click on the DOWNLOAD NOW button to download Mail.ru videos. Now you can use the two methods above for Mail.ru video download. Which method do you prefer to? For my part, WonderFox Free HD Video Converter Factory works best. It can analyze video URLs in an instant and download videos from websites without a hitch. Of course, it’s a great choice to convert formats between various videos and do basic video editing. The professional video converter enables to download videos from 300+ sites, convert and edit videos in the easiest way. It also supports batch conversion mode and hardware acceleration to achieve up to 50X faster conversion speed.